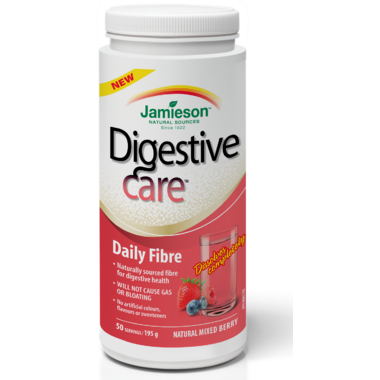 Jamieson Digestive Care Daily Fibre is the only fibre powder that does not cause gas or bloating*. It contains no artificial colours, flavours or sweeteners, dissolves completely and has a delicious flavour. * Well tolerated in terms of GI (gastrointestinal) distress, such as gas, bloating and abdominal pain. Directions – Adults: Mix 1 heaping teaspoon (3.9 g) into 240 mL (8 oz.) of water, up to 3 times daily. Store between 15°C and 25°C, away from children. Also contains: Natural mixed berry flavour, stevia, citric acid, natural beet root colour, silica. NO salt (NaCl), sugar, gluten, lactose, artificial colours, flavours, or sweeteners.